Let me explain quantum mechanics. A woman says to a man, “Oh, you’re such a brute.” What does she mean? Well, it depends. The words have meaning in themselves but the way they’re delivered also counts for something. Let’s say that she delivers the line with an aggressive posture, a scowl on her face, and a harsh tone in her voice. Most of us would conclude that the man should take her words literally; she’s angry and the man should back off. On the other hand, let’s say she delivers the same line with a smile on her face, a flirtatious giggle in her voice, and a soft, inviting posture. She uses the same words but delivers them in a very different way. Most people would conclude that she doesn’t mean for her words to be taken literally. What she does mean may not be crystal clear but it’s probably not the literal words she speaks. (By the way, I adapted this example from an excellent article in New Scientist). This is what Albert Mehrabian, the father of the so-called 7%-38%-55% rule, was studying. Mehrabian was trying to identify how face-to-face communication actually transpires, especially when the words are ambiguous. He identified three basic components: 1) the words themselves; 2) tone of voice; and 3) body language, including facial expressions. These are often summarized as the three V’s – verbal, vocal, visual. In ambiguous situations, especially when discussing feelings, how do you sort out what the other person means? Mehrabian calculated that the words themselves account for 7% of the meaning (from the perspective of the receiver). Tone-of-voice accounts for 38% of the meaning, and body language accounts for 55%. To determine whether you’re really a brute or not, you should probably pay less attention to what the woman says and more attention to how she says it. (For more on the multiple meanings of simple words, click here). Mehrabian’s findings may be accurate in the very specific case of conveying feelings in face-to-face communication. Unfortunately, far too many “experts” have over-extrapolated the data and applied it to all communications. When you give a speech, for instance, they may claim that 93% of what the audience receives comes from tone-of-voice and body language. If that were really true, then why speak at all? If 93% of meaning comes from non-verbal channels, a good mime should be able to deliver a speech just as well as you can. Indeed, if 93% of communication is non-verbal, then why do we bother to learn foreign languages? 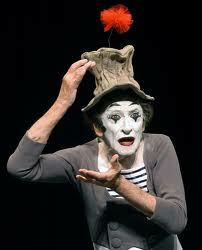 Fortunately or unfortunately, even Marcel Marceau (pictured) can’t effectively deliver an information-laden speech without words. Words are important – use them wisely and use them sparingly. Body language is also important. The best advice on body language is simple: you should appear comfortable and confident to your audience. If you don’t, your audience will wonder what you’re hiding. If you do appear comfortable and confident, your audience will attend to your words – for much more than 7% of the meaning.